Connecticut American Bulldog Rescue View other American Bulldogs for adoption. Hi! 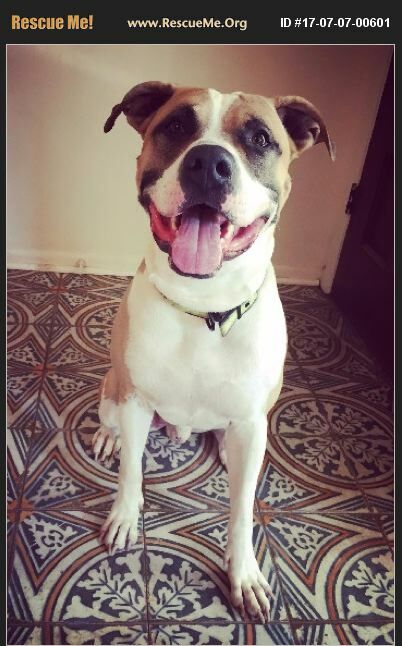 I'm Bruno and I'm a 2-year-old American Bulldog that weighs about 70 lbs. I am the happiest boy you'll ever meet - my tail is always wagging and I have a goofy bulldog smile! I've had 3 months of obedience training, so I'm incredibly well-trained! My favorite thing to do is to play with other dogs! I'm 100% house-trained (so no accidents in the house for me!) and I'm not destructive, so I'm allowed to free-roam in the house when nobody is home. I'm a gentle giant, but if we're in the house, I'll be your protector to strangers until you tell me that they're our friends. I love people of all sizes, but I'd do best in a house with children over 12 years old (since sometimes I jump up when I'm excited). I like to run around outside, but I settle down very easily inside the house - I love to burrow under blankets and sleep cuddled up next to you. So let me know if you're looking for a cuddle bug to be your forever friend! I currently live in a foster home in Texas, but transport will be included in the adoption fee and arranged by Rescue Road Trip if you choose to adopt!